Webgains is a performance marketing (affiliate) company that connects advertisers with online publishers to help drive traffic to their site. They help drive sales through price comparison sites, search, call tracking, content publishing, blogging, email marketing and of course remarketing. They aim for their account managers to become an extension of your team so they are able to continually learn, improve and re-evaluate your marketing campaigns to ensure they are always at the highest of standards. Put simply, Webgains helps you to continually drive and deliver results whatever your marketing strategy or campaign is. We work with Webgains to provide advertisers with the opportunity to drive traffic back to their site through various remarketing solutions. Our partnership with Webgains means that clients are able to install the SaleCycle tag easily through their network without the need for a developer. 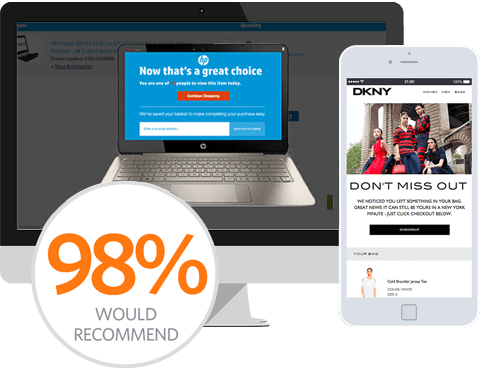 This means faster implementation so clients can get their remarketing solutions up and running on their site in no time. When clients come to SaleCyle through the Webgains network, clients can access performance data which includes their remarketing data all in one nice platform, which is great when it comes to managing and monitoring all of your marketing activity. Advertisers can expect our dedicated account managers to work closely with your Webgain’s affiliate managers, continually adapting and evolving clients remarketing campaigns to achieve the best results. Our aim is to act as an addition to our client’s marketing teams by adding our expertise to the mix. By being a part of the client’s marketing team, we believe we can create a successful remarketing campaign that can add to the success of the overall marketing strategy. Use SaleCycle's solutions through the Webgains network without the need for a direct contract. Easy to deploy the SaleCycle tag leading to faster implementation. Close working relationship between all 3 parties.